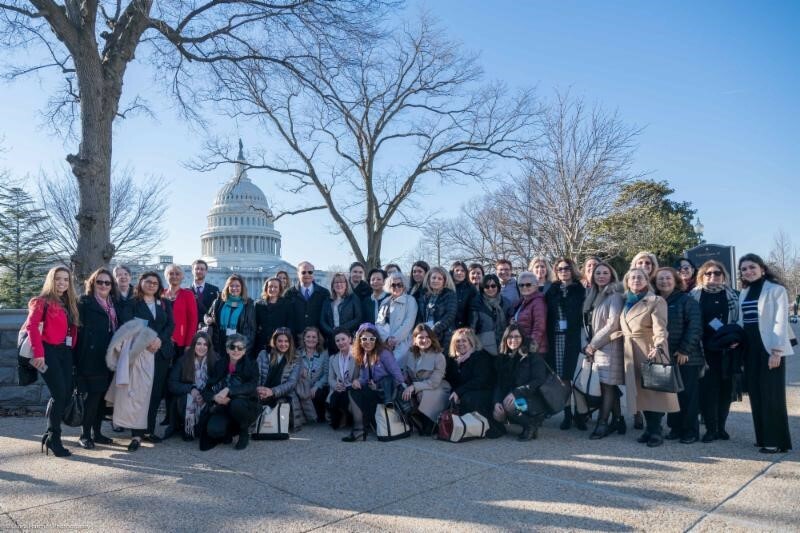 34 distinguished female community leaders from all regions of the United States traveled to the nation’s capital for discussions on enhancing women’s political engagement. Delegates came from the District of Columbia and 15 states—California, Colorado, Florida, Georgia, Illinois, Maryland, Massachusetts, Michigan, New Jersey, New York, North Carolina, Pennsylvania, Texas, Virginia, and Washington. In addition to working sessions with leading experts, they met with 12 Members of the 116th Congress and senior staff. The leadership forum is a component of the Turkish American Women’s Leadership Initiative established by TCA in May 2017. The purpose of this initiative is to inspire Turkish American women from all walks of life to participate in the political arena. The program included panel discussions on issues pertinent to Turkish American women, the responsibilities of congressional offices, the importance of maintaining continuous dialogue with elected officials, entrepreneurship, perspectives on U.S.-Turkey relations, women’s rights and activism and women in U.S. politics. The delegates received an exclusive tour of the U.S. Capitol and a briefing by Congresswoman Virginia Foxx (NC-5th) in the chamber of the U.S. House of Representatives on the operational procedures of Congress. Congressman Steve Chabot (OH-1st), a Co-Chair of the Congressional Caucus on U.S.-Turkey Relations and Turkish Americans (Turkey Caucus), spoke at the concluding dinner. A welcoming reception in honor of the Forum delegates was held on Capitol Hill in cooperation with the four Co-Chairs of the Turkey Caucus. Members of Congress who attended the reception were Representatives Don Beyer (VA-8th), Steve Cohen (TN-9th), Tom Cole (OK-4th), Eddie Bernice Johnson (TX-30th), Ann McLane Kuster (NH-2nd), Tom Malinowski (NJ-7th), Carol Miller (WV-3rd), Rep. Jimmy Panetta (CA-20th), Guy Reschenthaler (PA-14th), and Joe Wilson (SC-2nd). Officials from the Turkish Embassy in Washington, D.C. and representatives of the Turkish American organizations also attended the reception to meet the delegates.